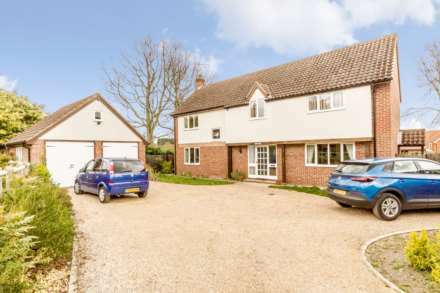 Situated in the Norfolk market town of Swaffham, Longsons are delighted to bring to the market this superb, very well presented, spacious four bedroom detached house with two detached garages. 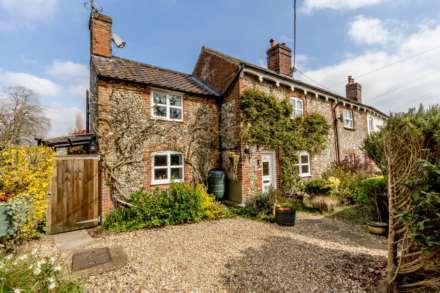 The property offers flexible accommodation and boasts three reception rooms, utility room, en-suite bathroom, air conditioning to first floor, cloakroom with WC, generous gardens, parking for numerous vehicles and electric gates opening to the property grounds. Viewing highly recommended to fully appreciate all on offer. The property offers entrance porch, entrance hall, sitting room, dining room, family room, kitchen, utility room, conservatory, cloakroom with WC, four bedrooms, en-suite bathroom to master bedroom, family bathroom, gardens, two detached garages, parking for numerous vehicles. UPVC double glazed entrance door to front, obscure glass UPVC double glazed windows to front and sides, mosaic tiles to floor, radiator. Stairs to first floor, built in storage cupboard, wood effect laminate to floor, radiator. Open feature fireplace with ornate brick surround and hearth, two UPVC double glazed windows to rear, double doors opening to family room, two radiators. UPVC double glazed French doors opening to garden with full height UPVC double glazed windows either side, UPVC double glazed windows to sides, tiles to floor. Feature fireplace with inset electric fire, walk in UPVC double glazed window to side, UPVC double glazed window to front, radiator. Fitted kitchen units to wall and floor, work surface over, composite one and half bowl sink unit with mixer tap and drainer, island unit with breakfast bar, integral electric double oven, integral ceramic hob with extractor hood over, space and plumbing for dishwasher, tiles to floor, UPVC double glazed windows to front and side, radiator. Fitted kitchen units to wall and floor, work surface over, composite sink unit with mixer tap, built in storage cupboard, UPVC entrance door opening to conservatory, tiles to floor, space and plumbing for washing machine, space and plumbing for dishwasher. Wooden conservatory, entrance door opening to rear, electric lights, tiles to floor. Wash basin set within fitted cabinets, WC, obscure glass UPVC double glazed window to rear, tiles to floor, radiator. Built in airing cupboard housing radiator and fitted air conditioning unit to provide cooling to first floor. Built in wardrobe, UPVC double glazed windows to rear and side, two radiators, door to en-suite bathroom. Bathroom suite comprising bath with hand shower attachment, wash basin set within fitted cabinet, WC, tiled splashback, built in cupboard, obscure glass UPVC double glazed window to side, radiator. Bathroom suite comprising corner bath with hand shower mixer attachment, fully tiled shower cubicle, wash basin set within fitted cabinet, wood effect laminate to floor, tiled splashback, extractor fan, UPVC obscure glass double glazed window to side, radiator. WC, obscure glass UPVC double glazed window to rear, radiator. Secure motorised electric double gates providing access to front garden with driveway and parking areas providing parking for numerous vehicles, two detached garages, area laid to lawn, selection of established trees, hedge and wooden fence to perimeter. Enclosed garden, laid to lawn, paved patio seating area, two wooden summer houses, selection of established trees, wooden fence to perimeter.